Heeft u een vraag voor The Style Guesthouse? The Style Guesthouse is gelegen in Daegu Central gebied in Daegu en een uitstekende keuze voor een plezierig en ontspannen verblijf. Het hotel ligt niet ver van het stadscentrum: de afstand is ongeveer 0.7 km en het duurt, over het algemeen, ongeveer 20 minuten om het vliegveld te bereiken. Dankzij de praktische ligging, biedt de accommodatie eenvoudig toegang tot alle belangrijke trekpleisters van de stad. De faciliteiten en diensten die door The Style Guesthouse worden geboden, garanderen een plezierig verblijf voor gasten. De accommodatie heeft een uitgebreid aanbod aan services, inclusief gratis wi-fi in alle kamers, 24-uur beveiliging, dagelijkse schoonmaak, wasserette, post service. Alle accommodaties beschikken over goeddoordachte voorzieningen om een ongeëvenaard gevoel van comfort te garanderen. U kunt de hele dag genieten van de ontspannen sfeer van de zwembad (buiten). Wat de reden van uw bezoek aan Daegu ook is, The Style Guesthouse is de perfecte keuze voor een enerverende vakantie. De accommodatie accepteert geen boekingen van inwoners vanwege de wetgeving. Laattijdige check-in is alleen op voorafgaand verzoek mogelijk. Het inchecken en ontbijt vinden in de lobby op de eerste verdieping plaats. I had a great night here. It was my first time traveling in Daegu and it was my first time staying at dormitory. The bed is quite comfortable and I like that they give you privacy on your bed. Definitely will comeback to stay here if I visit to Daegu next time! Staffs (and the owner) are kind and helpful. Place is good and clean, though there are some mosquitoes in the room (which was not a big problem for me but could be one for others). Overall, it was a pleasant and affordable stay as I got promotion at that time hahaha. Thanks! The place is comfortable if a little shabby. The downstairs bathroom is awful, but the bathrooms in the actual rooms are fine. The beds are comfortable, though the frames are coming apart a little bit. The location is about a 10 minute walk from 2 different subway stations in opposite directions, so it's fairly convenient. The staff is very nice and the breakfast services are quite good. Good experience overall. It's a bit of a walk from the nearest subway station, but manageable. They have a book showing you how to use buses or other transport to get to good places in Daegu. The reception is nice, but one of the receptionists (I think she works mornings) doesn't speak much English. The breakfast is only 8:30-9:30, which is crappy. However, it's nice to have some eggs that you can make in whatever style you like. The toaster is difficult to figure out. They have free water. Bathrooms are clean. Curtains for the capsules just barely cover the entire wall. They provide small towels and shampoo and body wash. Fine place to stay, I liked the privacy for the price of a regular dorm. Not much to do in Daegu though. We stayed at the second floor(Happy room), it was nice and the bed is actually really comfortable. The only thing I would want to complain is the ladder to the upper bed is way too narrow.... It's quite inconvenient for guests to climb up and down. (I found out half of the ladders are in the reasonable width). Other then this, it was an joyful experience to stay at The Style Guesthouse! Love the kind staffs!! I was in Daegu for a conference and the location from The Style to the conference locations were 10-15 minutes walking. Access to public transportation was also very easy. The staff at The Style were very kind and helpful and always greeted you with a smile. My bed was large and comfortable, all the basic amenities one might need was provided for, they even gave us a simple but filling breakfast every morning. I would stay here again if I do find myself in Daegu in the future. Good location and reasonable quality/ value money even if the cleanliness should be improved. Also, it would be nice that all the members of the staffs speak a more fluent English and are able to give easily advices on the places to visit! Daegu is a perfect place to relax for a few days, enjoy the Night Market's food-stall delicacies, and wander off to nearby Haeinsa. The Style is pretty much perfect for all of this; their self check-in system is very helpful for those of you arriving on late-night buses, and their staff is extremely friendly and helpful. Plus, the dorm room was very, very comfy, with a great wifi signal and clean bathrooms. Location-wise, it's not exactly in the middle of things, but a ten minute walk can get you anywhere. I've stayed a week in the dormitory at style hostel. The place is comfortable, clean with good equipments and useful services . Breakfast is simple but nice . Room, bed and bathroom are tidy and clean . Wifi works very well. 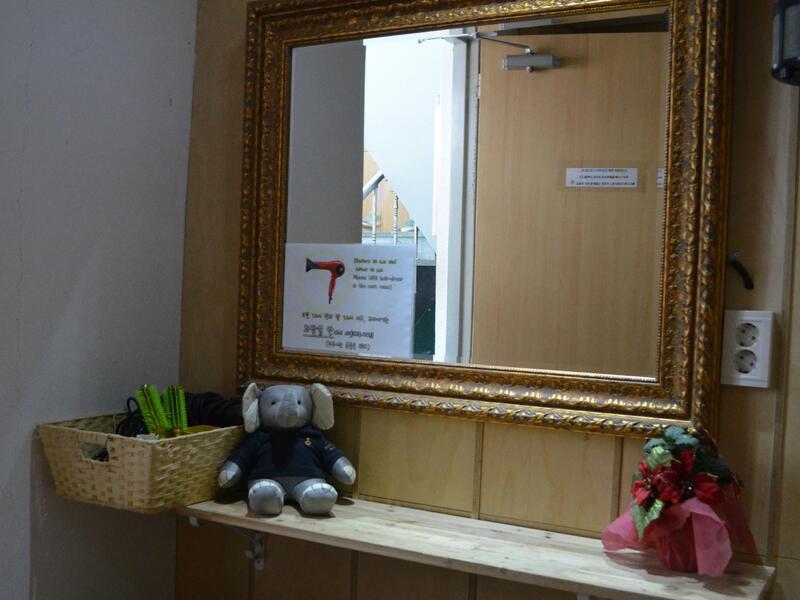 Staff and management are all very nice and helpful people willing to make your stay as enjoyable as possible . Thanks again ! Our room, Gam, private one was on another building: Hanock. It was an oriental stay, with no matress and an sliding door over the pool. We expected something much more convencional, So it was great. Cons: Some moisture on ceilings on bathrooms and the thin matress could not be good for long stays. It's kinda a little bit far from subway station, if you have to carry heavy bag then you should think twice before booking, but if you have suitcase with you then it's fine! The cafe is at the first floor and the atmosphere is awesome!!! The public area is very relaxible and staff helped a lot! I would like to stay again if going to Daegu! Staff are welcoming. Provided door code so you can come and go as you please. Not that close to downtown. Maybe a 20 minute walk? Floorboards in the bathroom are broken. A little bit of a hazard. Comfortable sleep. Easy checkout. Just leave at 11am. Very good for the price. The location is hard to find but it's close to downtown so you can go get drunk easily. They also sell beer in the guesthouse and there are usually cool people hanging out in the lobby drinking together. Also Joey is handsome. The guesthouse really stands out from other guesthouses I have been to. For one, the first floor lobby has a kind of an industrial look which is really cool. There is a cafe where you can sit down and drink or chat with locals(btw a lot of people who aren't even staying the the guests often go there). One thing I would do is probably add some curtains in the lobby. Even though the air conditioner was on, it was still a bit warm. 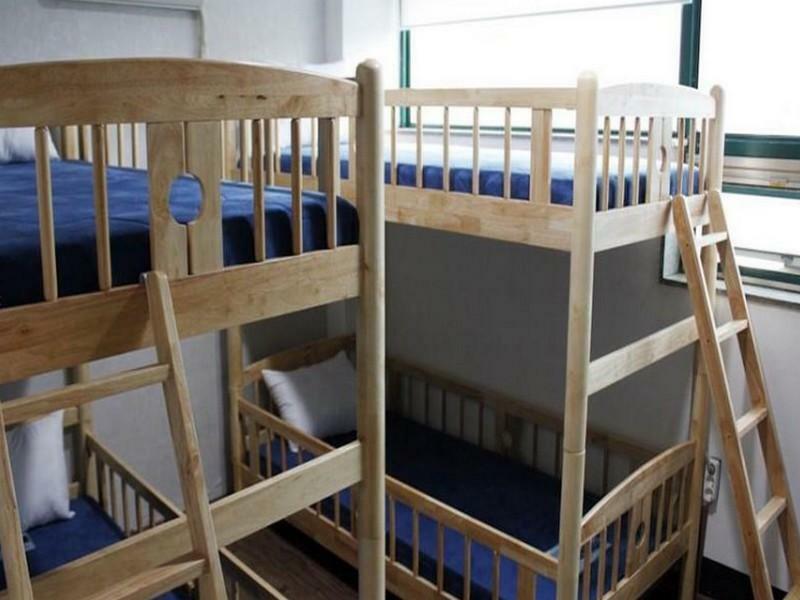 As for as the beds, they are pretty comfortable. First of all, every staffs in this guesthouse was very kind and helpful. They have helped me in making tour course and gave me a lot of information. Second, the design and facilities are very unique compare to other guesthouse in Korea. Being a back packer I arrived the hotel at 1 pm with my luggages and the reception was empty. Some gust told me that they will be back by 3pm. So I decided to book using my mobile aap not to waste my time. The default gust number is "2". So the app was saying that its teh last room. So I booked immediately. When i checked in by 4pm, I understood the hard truth. They only have one double room (hence the last room!) And the room is inside their dormitory. Thy dont even have any furniture! JUST A BED ON THE FLOOR! the room is so small that the bed exactly fits it the room. NO BEAD SHEET PILLOW, OR BLANKET. I took few bead sheets from the near by dorm and made myself comfy. in conclusion- NEVER OPT FOR THEIR DOUBLE ROOM. Most of the nice photos are their coffe shop/reception. 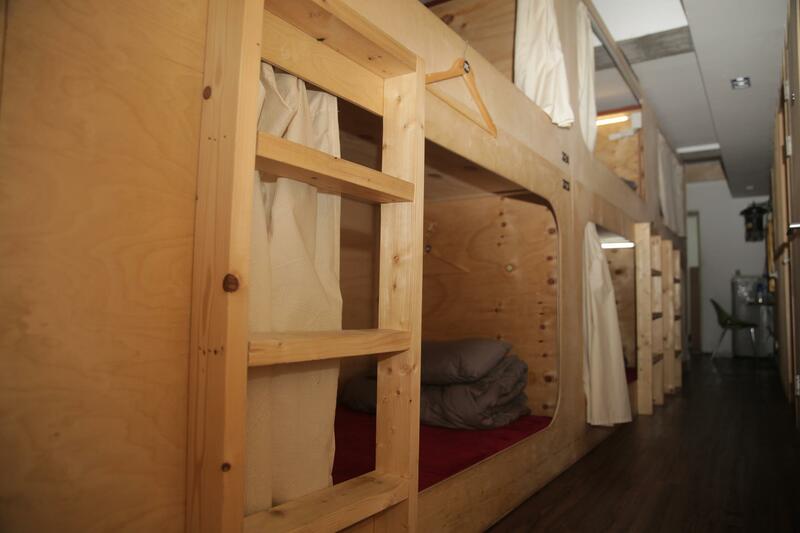 If you are a back packer, just want a night stay, opt for the dorm. The sleeping accommodations are well. You get a small capsule to sleep in. The location is two blocks from the metro station, and is centrally located from Downtown Daegu. Mimi was friendly and provided an outstanding service. My stay at the Style Guesthouse was excellent. Thanks. Central. Close to restaurants. Curtains for each bunk. I hated having to use the bathroom because it smelled so bad. Ceilings had mold and made friends with some bugs during my stay. (Larry and Jim. They were apparently "partners") Most of staff was okay but one guy went out of his way to let me know he doesnt appreciate my presence, unless there was someone important around. Ended up just avoiding the public spaces which kinda defeats the whole purpose of a hostel.